We’re so excited to announce that we will be walking on Sunday April 30, 2017 at 8:00am for the Autism Walk at Turner Field. We will be walking in honor of my daughter MaKenzie and the other 1 in 68 children that are diagnosed with Autism each year. We want to not only raise awareness of Autism, but to embrace and love on the families that live with Autism everyday. We would love it if you would join us. Please click here to join our team. His name is Andrew. When I saw the much talked about video 50 Cent made while taunting Andrew an Autistic male, I was outraged! It showed his lack of knowledge and awareness of Autism. It also displayed his ignorance. This young man was working, tending to his normal daily routine trying to have a sense of normalcy when 50 cent starts taunting him. Andrew appears to continue walking away from 50 cent, but the rapper continues to talk about him and record his (the rapper’s) own ignorance. This isn’t the rappers first apology related to Autism. How many times should he be allowed to make an apology without any consequences for his actions? It is evident that he needs to take some classes related to Autism and spend some time with Autistic people. In my opinion, donating money is always a rich persons way out of everything. It is not about the money! When will he try to understand the “heart” of a person with Autism or the caregivers? You can’t pay for empathy for a person and what happened to them, but you can show sympathy and bring awareness for the cause. 50 cent, what was Andrew doing that bothered you so much or frighten you that you had to taunt him? What made you use vulgar language towards him? What happened to respecting another human being? Did he say something to you: the famous, rich and powerful!? No! He, like countless others, are simply living their lives. Donating to the cause, but not understanding the cause is a slap in the face. Educate yourself about Autism. Learn about what you are apologizing for so that you grow from it and not make the same mistake next year. By making a huge donation, you’re still taunting Andrew, my child and others with Autism. I challenge you to spend a day in our world of Autism. Do something with the platform you have by Educating yourself and Empowering others! Autism does not have a face, race or gender; it has a “Heart”. 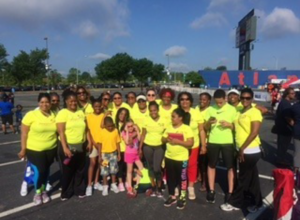 Join Heartfelt Connections at Turner Field 525 Capitol Ave, SW Atlanta, GA 30312 as we support Autism Speaks Walk Atlanta 2017. The Walk is an opportunity to bring awareness, support and educate the world of Autism. It is important to Heartfelt Connections to raise money for our families in our community. Become a supporter and donate! Heartfelt Connections, Inc. is a 501(c)(3) organization. All event proceeds, donations, and corporate sponsorships, will provide funding for our programs that assist families who have children with Autism or ADHD.